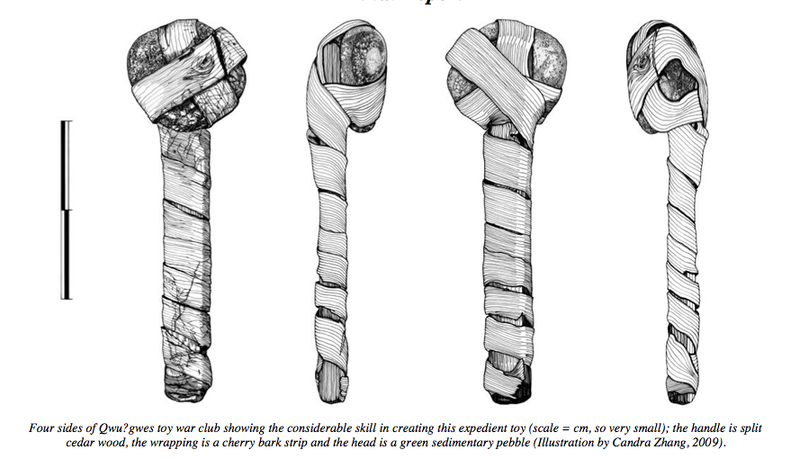 Toy war club from Qwu?gwes site. Source: Qwu?gwes Report. Click to enlarge. Dale Croes kindly sent me a link to the final report for the Qwu?gwes wet site (45TN240), which is is located on Mud Bay at the southern end of Eld Inlet, Puget Sound, near Olympia, Washington (map). The site was apparently first occupied about 800 years ago. This report, hosted at NewsWARP, checks in at almost 1,000 pages and about 80 megs, and is the product of more than 10 years of field-school and collaborative research with the Squaxin Tribe. There look to be about two dozen authors. If you’re not up for the whole thing right away, there’s a much shorter executive summary you can download here. But it’s a really impressive report covering everything from stone to bone to wood, bark, root, wood I.D., ethnobotany, paleo-seismology, fishtraps, and more. It’s very clearly written at an accessible, non-technical level, largely by students. I’ll pick out a few of many highlights below. Toy war club in situ at Qwu?gwes. Source: Qwu?gwes report. Click to enlarge. 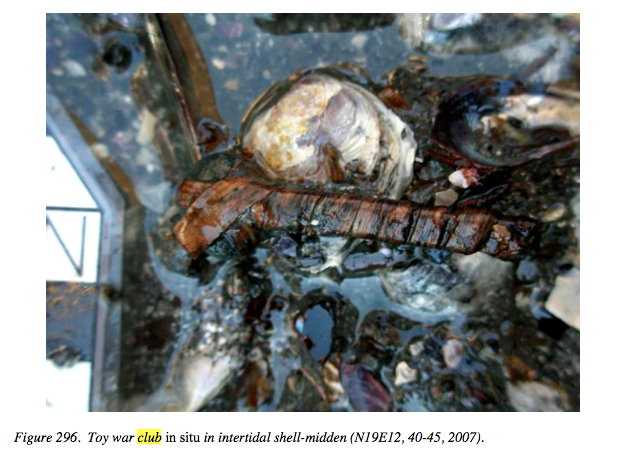 The toy war club shown at the top, and above is obviously one of the most striking finds from the site. Measuring only about 4.5 cm long, it is clearly too small to make much of an impact on any enemy (other than a mosquito, I suppose). The discussion of this artifact starts on page 507, in which Croes makes a comparison to the Ozette wet site, where over 50 miniatures were found. Such miniatures seem like a ripe topic for more discussion. My inclination is that they are indeed toys, but I recall a discussion on this blog from way back about miniatures being conduits for supernatural power. Compare also the tiny ulu from the Arctic I posted about once upon a time. Who wants to do the archaeology of children? Or of shamans? Or, scarily, of powerful child shamans? Clam Steaming Pit at Quinalt. Source: Qwu?gwes Report. Click to enlarge. A large fire is kindled, upon which they place a bed of stones, which when the wood is burnt down, becomes perfectly heated. Layers of green leaves, or pine boughs, are then placed upon the stones, and the fish, clams, etc. being laid upon them, water is poured over them, and the whole closely covered with mats, to keep them in steam (Miller 1983:42). The Lummi apparently cultivated them at Elelung on Orcas Island. They removed the largest rocks out to the extreme low water mark, setting them in rows like a fence. Since only small pebbles and sand were left to dig in, clam digging was easier. These beds were gathered only by the owner who had cultivated the beds, while other beds were used by everyone (Miller 1983:41). Despite the careful management, the authors do note some apparent size/age decline in some clam species through time, showing a degree of pressure put onto this important resource. There’s also a good analysis of the resultant volumes of fire cracked rock, which is welcome – this artifact type is commonly neglected or treated with contempt! Clam Steaming Pit. Source: Qwu?gwes Report. Click to enlarge. 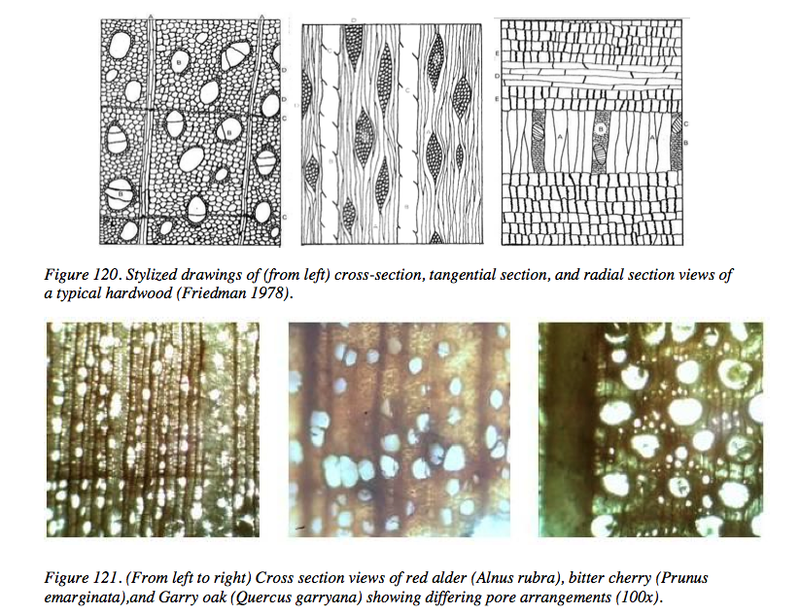 Finally, the centrepiece of the report is the attention to organic artifacts, and there are very clear sections presented on wood I.D. and organic technology. Friend of this blog Kathleen Hawes had a big hand in this analysis though as always the teamwork is apparent. Qwu?gwes basketry recovery. Source: Qwu?gwes report. Ciick to enlarge. 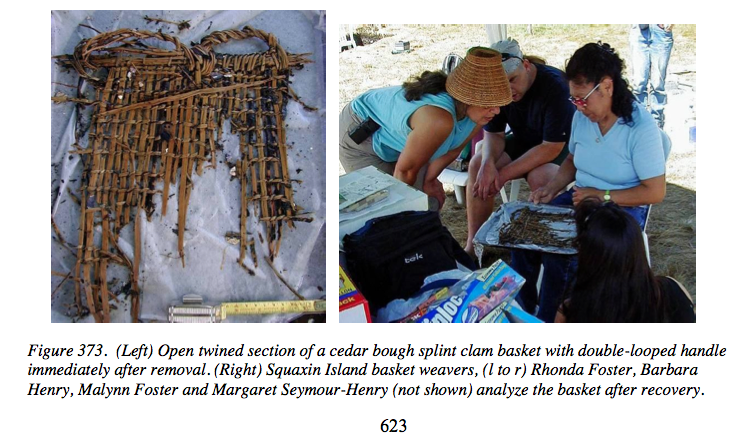 Basketry and related technologies is supremely important on the Northwest Coast. It tends to encode a lot of stylistic information and the many different ways of making functionally-identical baskets means that it might be a good marker of ethnicity or even lineages. Interpreting basketry requires insight, often gained by practicing the craft and consulting with living masters (mistresses, most often) of the art form. Archaeologists can trace existing forms back through time, and highlight novel forms and materials from days gone by. Part of this is technological, and part a close understanding of the raw materials used in basketry and related technologies. For this, identification of archaeological wood is needed, and there are some very clear illustrations (see below) of some of the landmarks and diagnostic features used. I hear there will be a lively session at next Springs NW Anthropology Conference in Bellingham on wet site archaeology, so maybe see you there. Wood identification at Qwu?gwes. Source: Qwu?gwes report. Click to enlarge. So, enough of the recap, I am sure many of you would enjoy looking through the report, which is an exemplary piece of work integrating professionals, tribal members, and student research. Dale, as many of you know, is recently retired from his long-standing position at South Puget Sound Community College, though he will remain affiliated there and at Washington State U. Many of his publications are available if you click the PDF link below. He continues to maintain the valuable NewsWARP.info site, which collates news on wetland archaeological projects worldwide. He asked me to post his new contact information, so his friends and colleagues can keep in touch. So, congrats to Dale and all involved in the report, and hope to see you back up at Kilgii Gwaay one of these years soon – or if not, back in Victoria, at Hoko, Forks, or any of your other haunts. 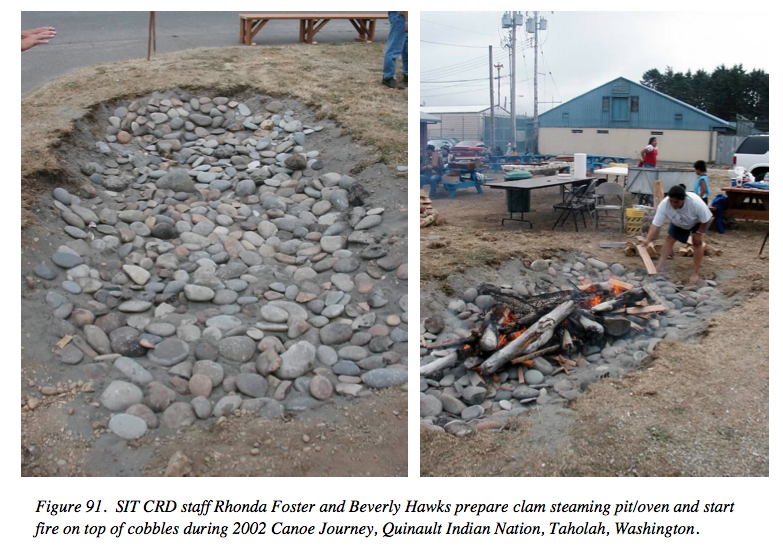 This entry was posted in anthropology, Archaeology, Northwest Coast, Shell Middens, Technology, Washington State and tagged basketry, Dale Croes, Olympia, Puget Sound, Qwu?gwes, Salish, Salish Sea, Squaxin, toys, waterlogged sites, wet sites. Bookmark the permalink. Wow, excellent news – such a great contribution. Many congrats to the team! Quentin: Thanks for the retirement sendoff—and posting my new contact information. In my retirement wanderings I just went through Forks a few days ago and the Outfitters groceries/hardware store strangely had no garlic or wooden stakes—just bumper stickers saying Bite Me…..the crucifix on my dash must have helped! Also appreciate the overview and getting the Qwu?gwes information/data out. I was a student of Dr. Robert Dunnell at the UW and he always emphasized that data must be free—he would be happy, happy, happy. Since this is the first major report on the deep south (of Puget Sound) we immediately shared with those working on the Cixwicen Village site (sometimes Tse-whit-zen), and especially fauna experts Virginia Butler and Sarah Campbell. One of the highlights of the Qwu?gwes reports is the vertebrate fauna report by your very own UVic Rebecca Wigen—for one showing the site’s emphasis on fur-bearing animals. Fortunately, for me, Rebecca has worked on all my vertebrate fauna through the many years (from Hoko on). I wanted to add a link to the raw data too—indexed excel spread sheets: https://www.dropbox.com/s/av2xm7ykz5p4qle/45TN240%20Artifact%20Data.xls . Hope that works from dropbox. Click on the lower indexes tabs from acorn data through wood chips, with a bunch of fauna, lithics, and TAR in between. Thanks again for all you do and I would far rather be at Kigii Gwaay than Forks any day…..